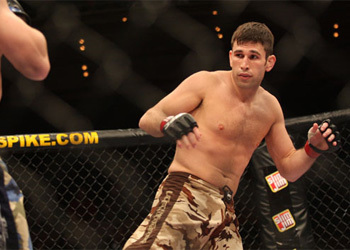 By the time UFC 101 rolls around, it will have been 14 months since we last saw The Ultimate Fighter 7 winner Amir Sadollah compete. Although his upset win against CB Dollaway on the TUF 7 Finale was the only win of his professional career, he knows the true tests are yet to come. After taking home the UFC’s six-figure contract, Sadollah took about five months off to allow his mind and body to recoup, then sufferred a minor injury that set him back, but he is good to go now. To help him with the transition from reality TV star to true MMA fighter, Sadollah followed his “TUF 7” coach, and former “TUF 1” champ Forrest Griffin to Xtreme Couture in Las Vegas, Nevada. A place that he now calls home. Sadollah knows that by winning the show, he now has a very large target on his back. Everyone will be gunning for him, trying to prove the only reason he is in the UFC is because he won the show. Not only will training at Xtreme Couture, one of the most talented fight camps in all of MMA, help in Sadollah’s development, but seeing Forrest on an everyday basis should be plenty of motivation for the rookie as well. Forrest was once in Sadollah’s shoes and has managed to become the UFC light heavyweight champion. A true fairytale story. Johny Hendricks will mark Sadollah’s second professional opponent, and his second in the middleweight division. Sadollah is a small 185-pounder, and has already considered making the drop down to the 170-pound division, a weight that may be much more suitable for him. Either way, his long journey to MMA stardom will officially begin on August 8th in Philadelphia, Pennsylvania. You can bet against him, however his entire life has been based on proving the naysayers wrong, but just take a look at where his starting point is.